Are you looking for a fun event to do with your children while coming together as a community to help fight cancer? Come join Franklin's 12th annual PMC Kids Ride being held on Sunday, June 10. The Franklin PMC Kids Ride will be one of more than 35 PMC Kids Rides throughout the New England area. Last year, the Franklin ride attracted over 250 young cyclists between the ages of 3 and 14, who rode between 3 and 10 miles. The ride exceeded their fundraising goal and raised more than $55,000 for cancer care and research at Dana-Farber Cancer Institute. The ride offers a way for children to become part of the PMC mission by involving them in volunteerism and fundraising in a safe and athletic way. 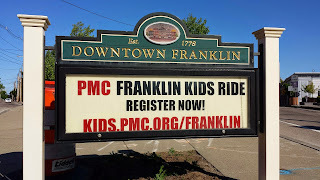 The Franklin PMC Kids Ride will be held on Sunday, June 10 from 8 AM to 12 PM, and will start and end at the Remington/Jefferson School, 628 Washington Street in Franklin. Kids can select from a 3, 6 or 10-mile course. Younger participants not yet on 2 wheels can take part in the Tikes and Trikes course in a contained area at the school. There is a $10 registration fee and a $30 fundraising minimum. There will be a party after the ride, with music, games, food, face painting and more. Register on line at http://www.kids.pmc.org/franklin.aspx. All local communities are encouraged to participate.